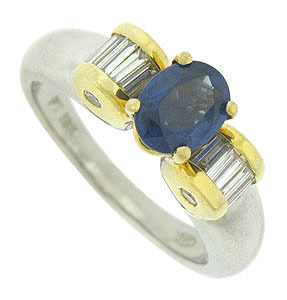 This exceptional bi-color engagement ring features a .70 carat, oval sapphire at the center. 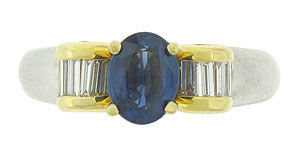 Bold, rolls of curling diamond baguettes flank the deep blue center stone. 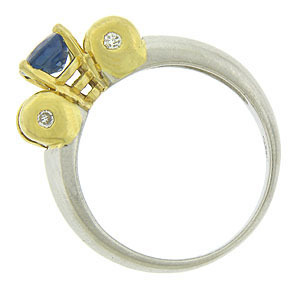 Single fine faceted diamonds press into the sides of the rounded yellow gold figures. The wide smoothly polished band is fashioned of 18K white gold. The estate ring is set with approximately 1.75 carats of diamonds and measures 7.98 mm in width. Circa: 1950. Size 9 1/4. We can re-size.